In the first version, the title, subtitle and author blended into the stone wall making them difficult to read. I tried putting these elements in little boxes, but they appeared to be pasted on as an afterthought. I was beginning to think the wall and the rune would have to go when I noticed other books that had a set-up similar to what I've done here. Everything looks like it belongs now and I'm happy with it. 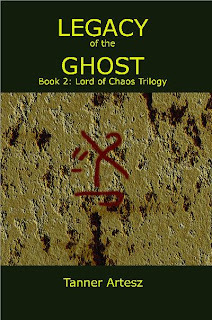 I've also added an explanation of the rune to the frontspace which makes the cover relevant to the story. Rolling Stones: Goats Head Soup, This came out in the early 1970s when music was becoming an important part of my life. The one song that puts this above all the other albums by The Rolling Stones is: "Dancing with Mr. D."
Rush: Hemispheres. It took a while for me to get used to Geddy Lee's voice. As a result, I prefer Rush's instrumentals though I do enjoy most of their music now. This album has "La Villa Strangiatto" on it. It still remains my all-time favorite Rush song. More again another time. I'm going back to clean up the beginning of Vengeance of the Ghost. oooo! I like. I knew there was something that bothered me but I couldn't figure it out. Looks good; I can't wait to see it on all the covers! !